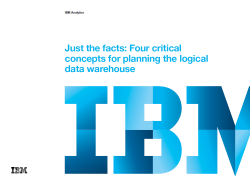 Download this e-book to explore the four key facts you need to consider when evaluating your data warehouse options. Generating insight from information is at the heart of any organization, and requires solutions capable of delivering speed, simplicity and efficiency. Moving to a modern data warehouse platform can help business growth and expansion.